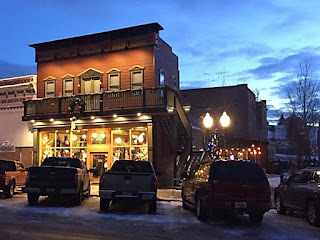 One of the most beautiful buildings in Philipsburg, Montana now for sale. With the location, this property was designed to be used as multiple businesses. The interior and exterior is by far one of the best on Broadway. Wonderful Boutique at 106 West Broadway and a suite above to live, have an office, or VRBO. 106 and 1/2 is now a Real Estate office and used to be The Daily Grind Coffee shop, which is still in place if one wanted to reopen. All connect to a private manicured court. Business is located across from the Philipsburg Brewery, Granite County Museum, Winninghoff Park Ice Rink and Arena. Flint Creek, Granite State Park, Georgetown Lake and, Discovery Ski Area are within driving distance if you are seeking adventure. Property is broker owned. Contact Deb today at (406) 239-5563. Priced at $599,999.